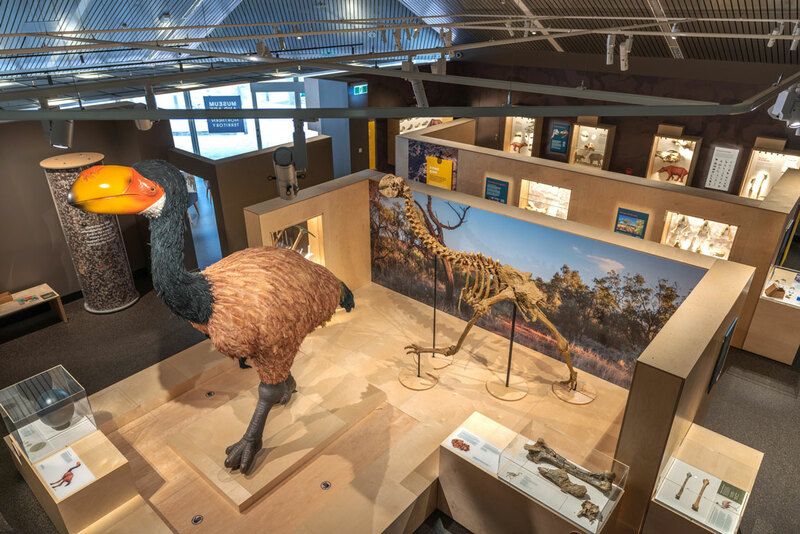 Megafauna Central is located on Todd Street Mall in the heart of Alice Springs. 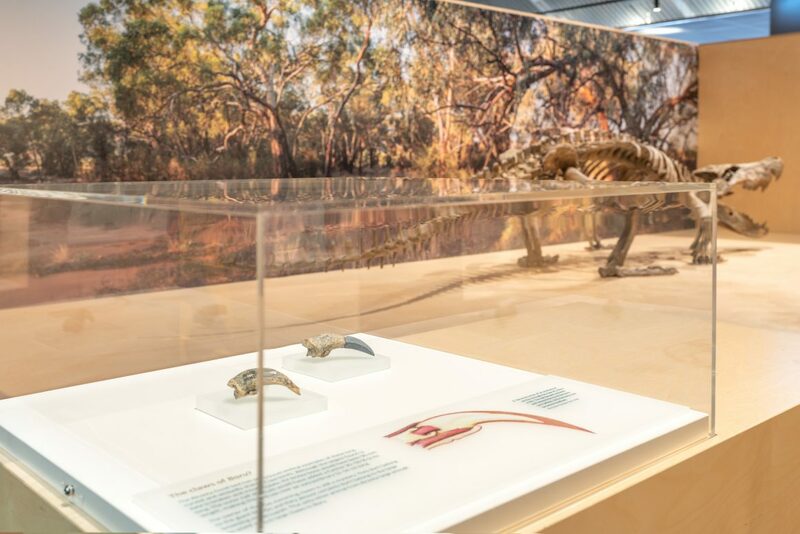 The exhibition showcases the amazing collection of eight-million-year-old fossils painstakingly collected by palaeontologists at Alcoota Station in Central Australia. 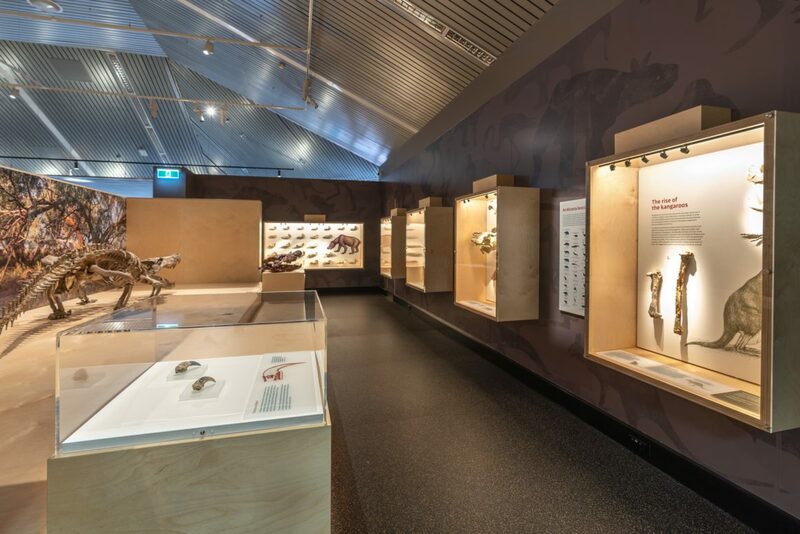 The challenge in this space was to create a well-paced exhibition that doesn’t reveal all its secrets at once, striking a balance between the huge skeletons and the small fossils. Four life-sized megafauna replicas are the largest objects in the exhibition and take up the bulk of the available space. The impact of their size is immense but would have been overwhelming if all were visible immediately on entry. 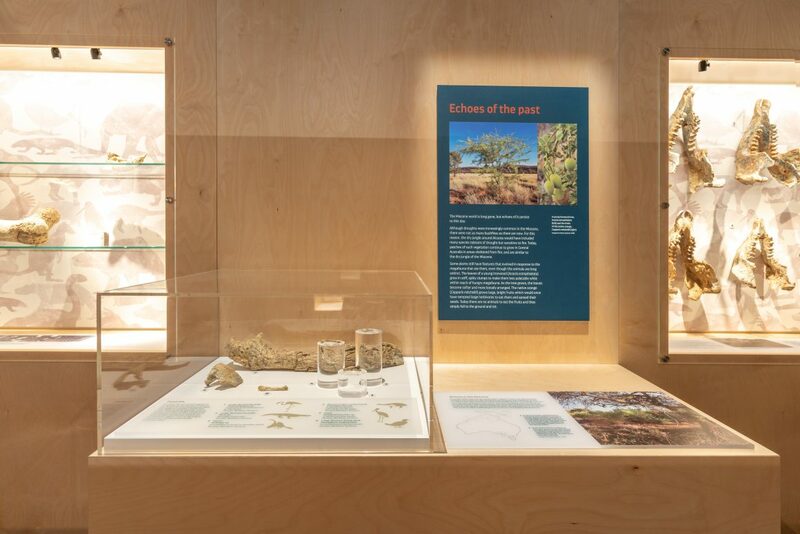 In order to create suspense in the exhibition we designed a set of modular walls that wrap around the large plinths, partially screening them from view until the visitor reaches them. There are glimpses, but not a full reveal: Dromornis stirtoni peers at you over the top of a wall; turn a corner and be confronted by the fearsome Baru. The visitor is on a journey through Alcoota and its treasures. 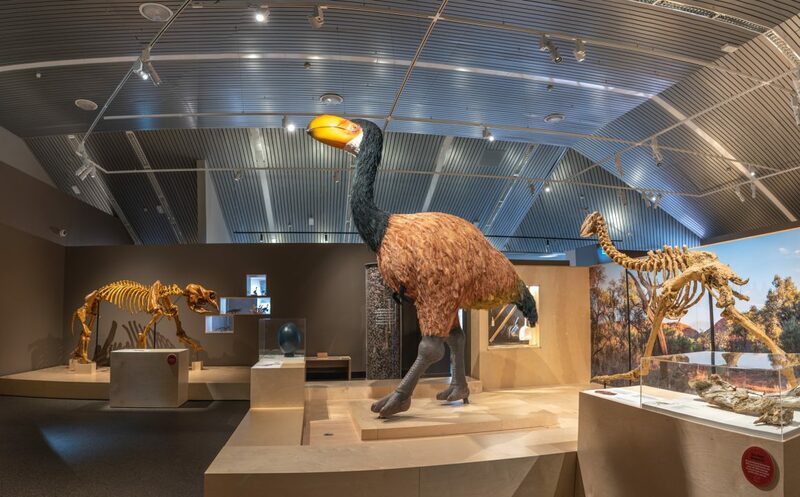 We placed large-scale backdrops onto the walls to evoke a sense of the site, its Miocene past, how the megafauna looked, and the current activity that goes on at Alcoota. The sense of journey is also embodied in the content locations. The exhibition layout reflects the non-linear nature of the exhibition themes. We placed the introductory, baseline information up front, but the experience is not diminished if the visitor takes a different path inside. 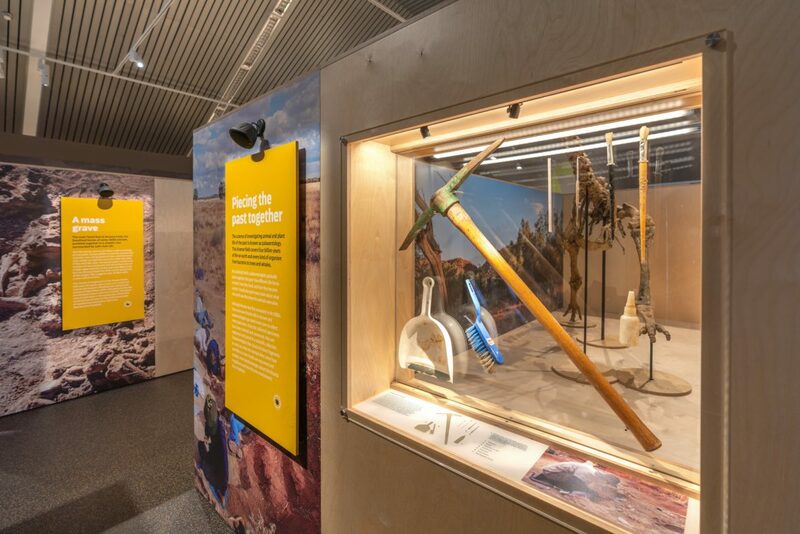 This exhibition is bilingual, so each theme panel contains a push button that triggers an audio translation into Arrernte. We designed integrated showcases and seats in front of each of the large plinths. These provide interpretation, object security and visitor seating in a seamless and elegant spatial solution. We deliberately selected a refined palette of materials and finishes. Plywood for the walls, plinths, showcases and seats, and clear acrylic for the showcase vitrines. The graphics, illustrations, photographs, content and interactives layer on top to provide colour and variety. We designed the joinery in a series of standard sizes so that the fabrication was inexpensive, and installation was streamlined and efficient. 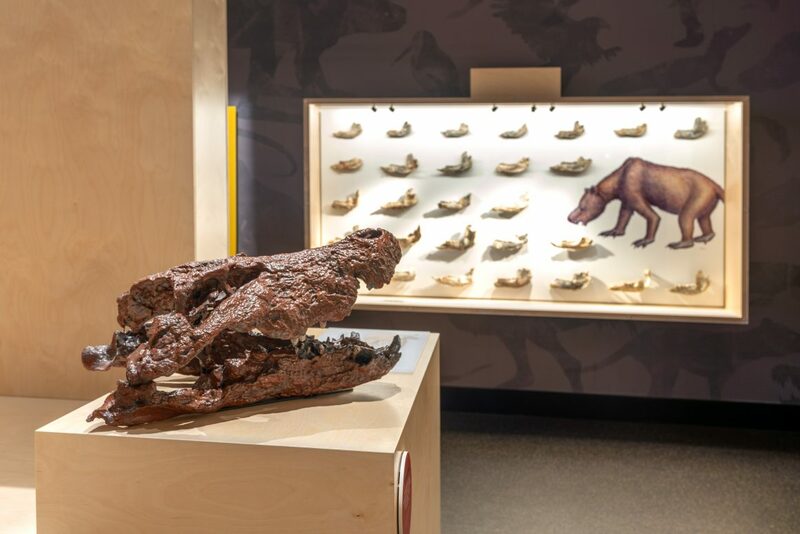 Megafauna Central is an absorbing, exciting exhibition experience that punches well above its weight in style, story and suspense.